3.5x5 easel frames made of high quality extra heavyweight cardboard with pull out easel for horizontal or vertical display on desk, mantel or tabletop. These sturdy easel frames are made of high quality heavyweight cardboard and are available for a variety of photo sizes. Easel back frames can sit on a desk or mantel and can be used for a variety of photographs including: Senior and school portraits, family portraits, engagement and wedding portraits, cruise and resort photography. 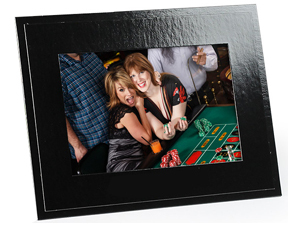 Overall size: 5-3/4" x 7-1/4"
Photo opening size: 3-1/4" x 4-3/4"